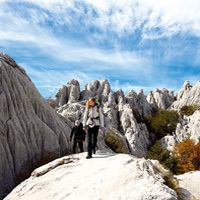 Hiking Paklenica National Park has over 150 kilometres of maintained hiking paths and trails, ranging from easy tourist trails to those more demanding that lead to the Velebit peaks (Vaganski vrh 1,758 m and Sveto brdo 1,753 m). There is a wide range of attractive locations accessible by maintained educational trails (Mirila, Terezijana, Premužićeva staza / Premužić's Trail) in the wider Velebit Nature Park area. Hiking maps are available at all info points in the Paklenica Riviera. 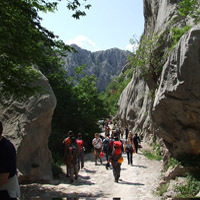 Alpinism Paklenica National Park is one of the best-known climbing destinations in Europe. The vertical cliffs of Velika Paklenica canyon, over 400 metres high, are located at the very entrance to the Park and are only 2 km from the coast. 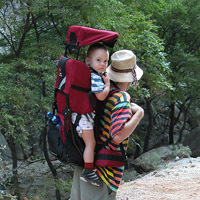 For this reason, Paklenica is a favourite with climbers with families. A frequent sight is a baby sleeping peacefully in a baby carriage, or a part of the family enjoying the beach, while the others climb. Expert climbing guidebooks are available at the Park Management building at the Park reception. Rafting/Canoeing Rafting on the wild rapids of the upper reaches of the Zrmanja River will leave even the most experienced adventurer breathless. When the water levels are lower in the summer months, there are organised kayak and canoe expeditions. Speleology Get a glimpse the subterranean world of Velebit! A karst area, Mt. 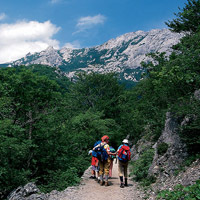 Velebit has an abundance of caves, and expert guides are available to take you on a speleological adventure. We absolutely recommend you visit Manita peć cave in Paklenica National Park, and the Cerovačke pećine (Cerovac Caves) near the town of Gračac, both protected geomorphological natural landmarks equipped for tourist excursions. There are other caves accessible to visitors; attractive due to the variety of forms and the wealth of stalactites and stalagmites and other cave formations.